Guess what, we went on a road trip to Hamilton! As Torontonians we think we have it all, which makes it pretty easy to forget the beauty and vibrancy of the region around us. But just outside our city limits, around Lake Ontario is where you’ll find one of the province’s best-kept secrets, Hamilton. The Civic Salon and the Young Urbanists League team up with local partners, Jay and Peter, to explore the history, ambitions, and future of Steeltown. 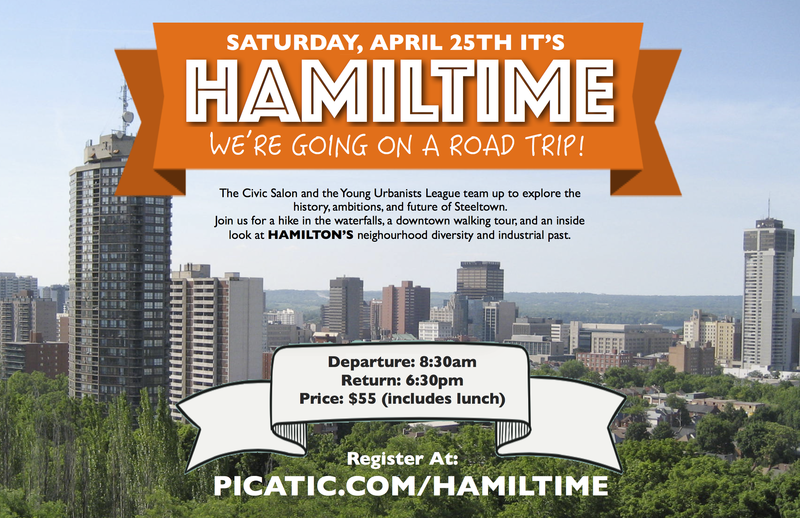 Come join us for a hike in the waterfalls, a downtown walking tour, and an inside look at Hamilton’s neighourhood diversity and industrial past. Meeting Spot: Pick up and drop off will be at the Coffee Pub at the Centre for Social Innovation (CSI) 720 Bathurst Street – meet in the cafe at 8:20am!